The flagstaff, flags, and moon outside the Red Lobster. I met friends for supper at Red Lobster last night. 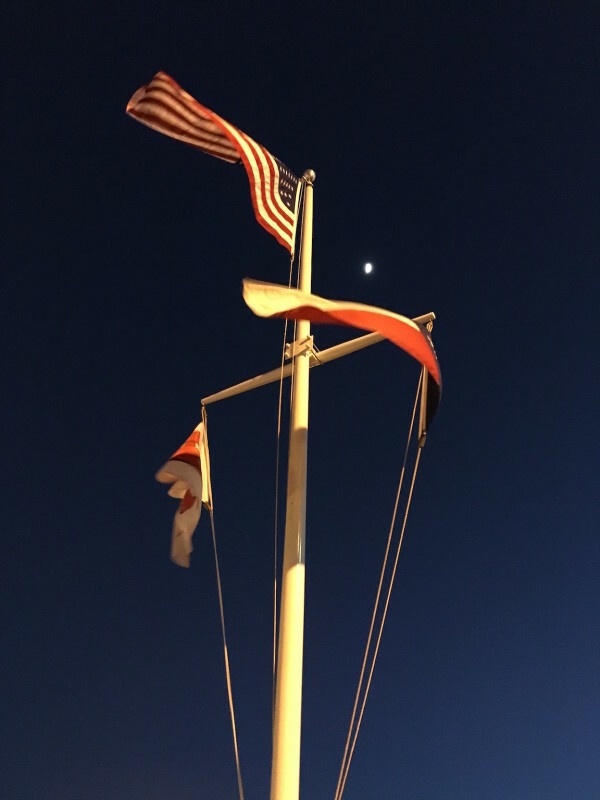 While the Girl and I waited outside for a few minutes (after a nice walk around the perimeter of the property), I noticed the juxtaposition of the flags, mast, and moon in the darkening sky. So, I grabbed the capture. The lesson, or at least one lesson, was to be aware. So many times I wander through this world too far in my head. I don’t let me eyes, and more specifically my mind, venture out from the inner space between my ears and take in this great big world. I finished Kennerly’s book a few days ago. One of his big themes was to look, because photographers have a different way of looking at the world. They see color, contrast, geometry, moment, composition, and a host of other small things that go into making a good capture, a good photograph. That cannot happen when I’m in my head. I lose awareness of what’s going on about me and I lose connection with this world, God’s creation. I know I’ll drop into a reverie this morning when we walk. It’s part of the walking process for me. I like to think while the Girl and I are exercising. But, I also like to interact with her while we’re exercising. She’s very interactive, when she’s not in Full Terrier Mode. We have a lot of fun interacting and the play time at the end of the walk is good for both of us. A tired dog is a happy dog… And, I think, the same goes for an old man. But, even more than that, there is a time to spend in inner space and a time to be more aware of God’s creation — to take part in being in that creation, to be thankful for that gift. I’m learning.